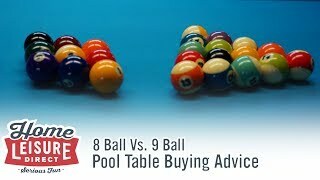 What's the Differences Between English and American Pool? What are the Differences Between English and American Pool? English Pool and American Pool. What makes them different if anything at all? Well, the fact is that there are in fact a LOT of differences between these two games that touches on virtually every aspect of the game. From the balls, the cues to the tables themselves. This guide will walk you through each aspect that makes both of these games so different, and to help you decide which game suits you the best. 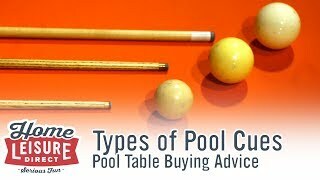 One of the biggest differences between English and American pool is the size and style of ball. American pool balls are instantly recognisable and the simplest sets to explain. They’re large, 2 ¼ inch balls finished with the iconic spots and stripes, with the cue ball matching the object ball in both size and weight. English pool balls on the other hand are a little more unique. For a start, the cue ball is marginally smaller than the object balls, being only 1 ? inches as opposed to 2 inches. The reason for this difference isn’t anything majorly important. 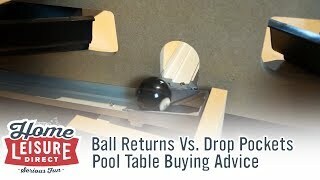 It is mainly to allow coin operated tables to separate the cue ball from the rest of the object balls. Despite many tournaments not using coin operated tables, the sizes of these balls are also used in English pool tournaments. The size and even the shape of pockets and cushions on English and American tables are also noticeably different. Let’s begin by looking at American styled tables. With the larger ball size on American tables, the pockets are also larger as a result. 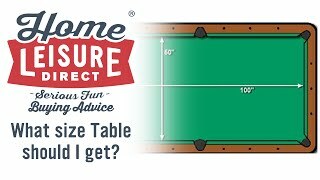 In fact, pockets on an American Table are just wide enough to fit two American pool balls in the ‘jaws’ of the pocket side by side perfectly. The shape of the pocket is also noticeably ‘angled’, almost to the extent that the cushions look like blades. This produces some very interesting effects on gameplay, primarily that it makes shots along the cushion into corner pockets a lot easier. After rolling along the cushion, the ball bounces against the angled surface and most times finds its way into the pocket. On the flipside of this, shooting into the side pockets is made more difficult, requiring a more direct approach to the pocket. Similarly, the shape of the cushions is also very angular, again almost producing a ‘blade’ for the balls to rebound off of. It’s easy to see why English balls tend not to be used on American tables too. Placing an English ball into the opening of any of the pockets will show you just how much smaller the English pool balls are by comparison. The smaller balls almost get lost! Equally, the taller contact point on the cushions often mean that smaller balls will not respond properly, due to contacting the cushion at a lower point than intended. Just like on an American table, the size of an English pool table pocket is smaller in size so to accommodate the smaller ball size. Also just like an American table, English pockets are allow roughly the same amount of space into the pocket relative to the ball size. This allows two balls to rest fairly neatly on the entry to the pocket. The pocket shape is also noticeably different. An English pocket has a noticeably smoother entry into the pocket than the more straight and angular American pockets. Almost opposite to an American table, English corner pockets are a lot more difficult to shoot into down a rail owing to the angle of the pocket. 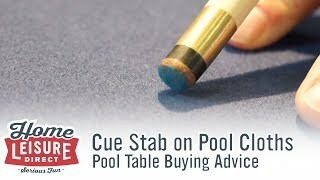 Conversely, side pockets are a lot easier to shoot on an English table! The lack of a more definite entry makes the side pockets a lot more accessible to angled approaches. English cushions are also a slightly different shape. A flat, rubber cushion is standard on an English table, with the cloth then running at an angle down to the playing surface. Once again, two American balls placed into the jaws of an English pocket really highlights how different the pocket sizes really are, which would make shots very difficult. Interestingly though, this is the premise of Chinese 8-Ball, where larger 2 ¼ inch balls are used on a snooker table with small pockets, making for a very challenging game of accuracy! 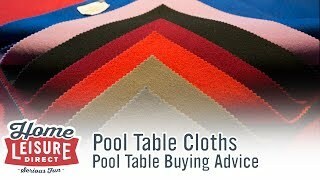 English and American pool tables also have a significant difference in what’s considered ‘standard’ size. 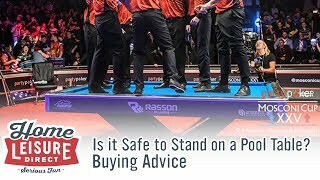 We have a guide regarding the standard tournament sizes for each style of table here, but don’t think that the sizes mentioned in this guide are the be all and end all. With larger balls and larger pockets, American tables are naturally bigger than English tables. An American tournament sized table measures in at 9 feet in length, however several other sizes are possible. Whilst 9 feet is the standard tournament size, it makes them rather big to fit into most homes. For this very reason, the most popular size for American tables is actually 8 feet in length. 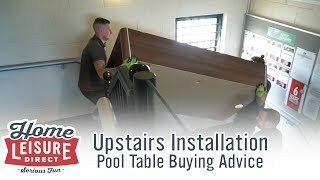 7 foot American tables are actually common too (and are favoured by many pool halls in America to allow as many tables into their space as possible), and tables larger than 9 feet are also available from various manufacturers, going as high in some cases as 12 feet. As you can probably guess by what we’ve said already, English tables are naturally smaller than their American cousins. The balls and pockets are smaller, and as a result don’t require as much of a surface to play on, making English style tables very versatile if you are short on space. 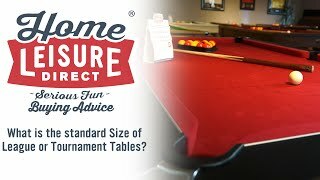 Standard tournament size on an English table is 7 feet, meaning that it’s relatively easy to fit a tournament grade table into a space*, making them the most popular size. English tables do start as small as 6 feet, and are often seen in pubs due to their small and versatile nature, but can go as large as 8 feet. Yet another big difference is the actual cloth that is used on the playing surface. The two do actually have very distinct characteristics, and as a result play very differently. An American style cloth is a smoother, faster playing cloth than an English one. If you were to run your hand over an American cloth, you would find it has no direction, and you can actually see the weave in the cloth if you were to look close enough. The ultimate result of this is a much faster game. In addition, you may also find that over time very small lightened marks will appear on your cloth. These marks are in fact very small burn marks, and are caused by friction as a result of the instant acceleration of the cue ball each time it is struck. These marks are completely normal on every table fitted with an American cloth. American cloths also don’t have to be strictly for American tables! It’s not uncommon for us to fit an American cloth to an English table as per a customer request, simply to get that speed of play right from your first ever frame on your new table. In addition, American cloths also feature several colours that are exclusive. An English style cloth has a noticeably furry feeling texture or a ‘nap’. Running your hands over this type of cloth has a very velvet-like feeling to it that runs in one direction down the table. This type of surface generates more friction on the balls themselves, meaning play is a little slower, especially when the cloth is brand new. When the cloth sees continued use, the nap eventually flattens and becomes a little faster to play on. Yet another difference to consider! We have another guide covering this subject in more detail, but we will cover briefly here. Owing to the different sizes of balls that are used, the cues are also very different. The body of an American cue is principally made out of a lighter maple wood. The tip and feral is also noticeably different from an English cue. Not only is the tip larger (at 13-14 mm in size to be suitable for the larger cue ball) but the feral is much larger, and made of plastic. This plastic actually gives the cue some shock absorbing qualities; ideal for striking the larger and heavier cue ball that is used. English cues tend to be thinner bodied with a much smaller tip. At its tip, an English pool cue normally measures about 8-9 mm wide, and uses a small feral made of brass for added strength. The wood used in the cue’s construction is typically ash, which is what gives English cues their noticeable grainy appearance. With different kinds of balls, there are different kinds of game to play too. 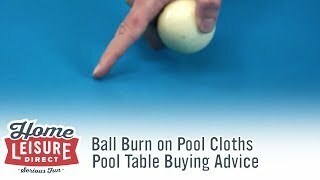 English pool balls normally come as a set of 2 inch diameter reds and yellows (sometimes blue and yellow depending on what you pick) with a single black ball or 8-ball. These allow you to play the classic game of English 8-ball where each player is assigned a colour, then it’s a race to pot the black. This game can also be played with a set of 2 inch spots and stripes, where instead of shooting for either colour, you go for either a solid or a stripe. American Pool is always played with spots and stripes balls in the larger 2 ¼ inch ball size. These balls allow players to play a game virtually identical to the one listed above. In addition though, there are also other great cue sports you can play, including the incredibly popular 9-ball. So which style should I buy? With so many differences between the two styles, just what style is right for you? Each has their own unique perks, so here’s a brief summary of what each style of game can offer you. Have you grown up loving playing in a pub or in a leisure centre? 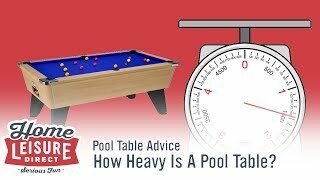 Then there’s an extremely high chance you’ve been enjoying pool on an English table! An English table will bring the game you know and love into your own home or games room. 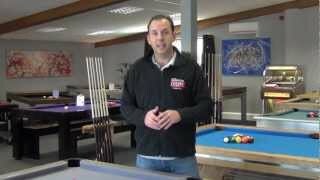 With the unique curved pocket styles that makes pocketing the balls more of a challenge, English Pool provides an ideal game for those truly looking to hone their pool playing skills, and take their game to the next level. 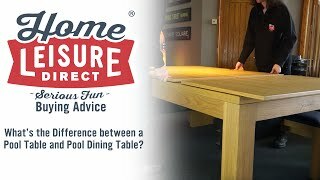 If you ever intend to play competitively in the pubs or at local pool leagues, then an English table is ideal for allowing you to get the practice in at home. Many people also want the chance to practice at home for when they play against their friends at local pubs to become the undisputed king of their local table. Being a little smaller than American tables, English tables are much more forgiving about the space they need. 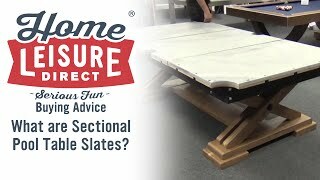 Starting at 6 feet in size, these tables can fit into plenty of different locations and still provide an incredible, tournament standard of gameplay on a premium slate bed. Because English tables tend to be smaller, they also tend to be cheaper too. A great quality slate bed English pool table can be purchased for approximately £700. American pool is undoubtedly the most common type of pool table seen around the world, from the United States of America to continental Europe. 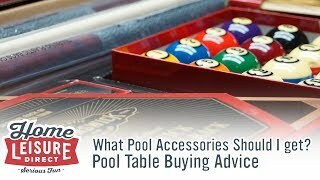 If you’ve played abroad or even in a dedicated pool hall, then you’ll be used to the type of game American pool offers. 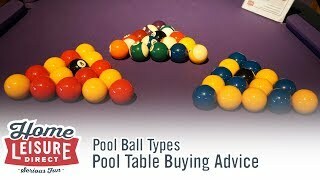 With the larger pockets and balls, American pool is an easier game to pick up and learn, especially good if you have children you’re looking to get into the game. The game is also a good deal faster with the smoother cloth. 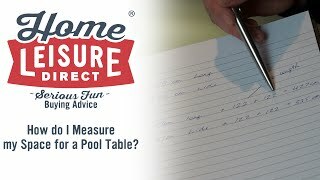 Just like English pool, if you’re hoping to play primarily in American pool tournaments, then having the right style of table will definitely give you the edge when it comes to practice. American pool tables leave an unmistakable impression when you see one in a room. They really are room centrepieces, and can come in some truly breathtaking designs. Equally, the allure of a major American brand may be enticing. Names such as Brunswick and Diamond are renown around the world as having some of the finest pool tables around. English and American Pool both have a number of differences between them. It’s quite remarkable that a game that looks so similar on the surface can have so many subtle and not-so-subtle differences. As a result, it’s impossible to name one better than the other with so many unique qualities that make each. It really is just a matter of personal preference as to which style of play suits you the best. If you are at all unsure about which style you should go for, feel free to call and speak to our team directly who will be more than happy to talk over any specifics that each game has. You can do so by calling 0800 622 6464 or 01454 413636, or dropping us an Email.